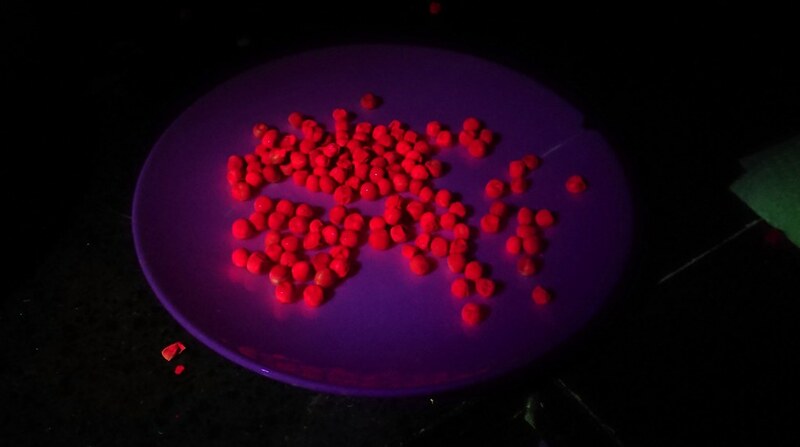 Whoa green peas fluoresce red!? Today I finished up this old ultrafire revamp. Sliced SST-20, FET+1 driver running anduril and a super cool AUX led setup. 33,200kcd & 1030 lumens, I was sad it didn’t quite hit my goal of 40kcd. 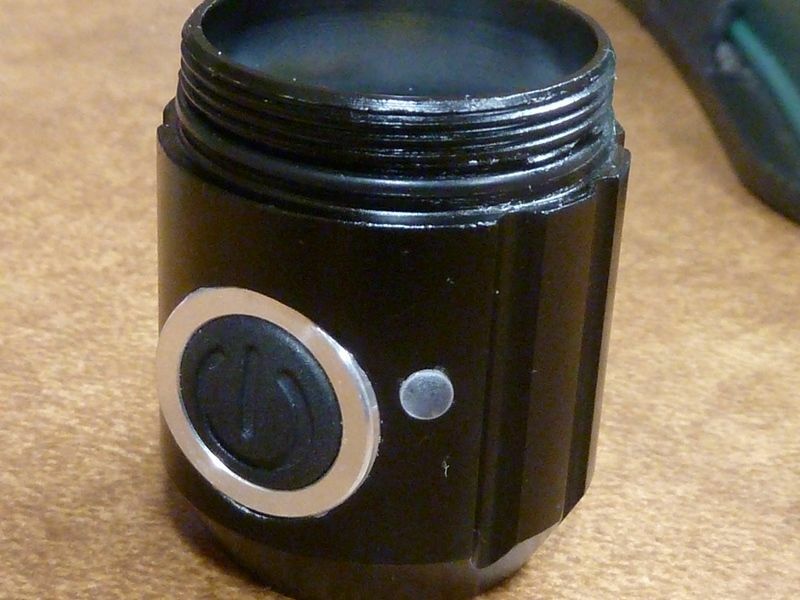 Where did you buy the GTmini driver? It’s not, it’s one of my own designs. 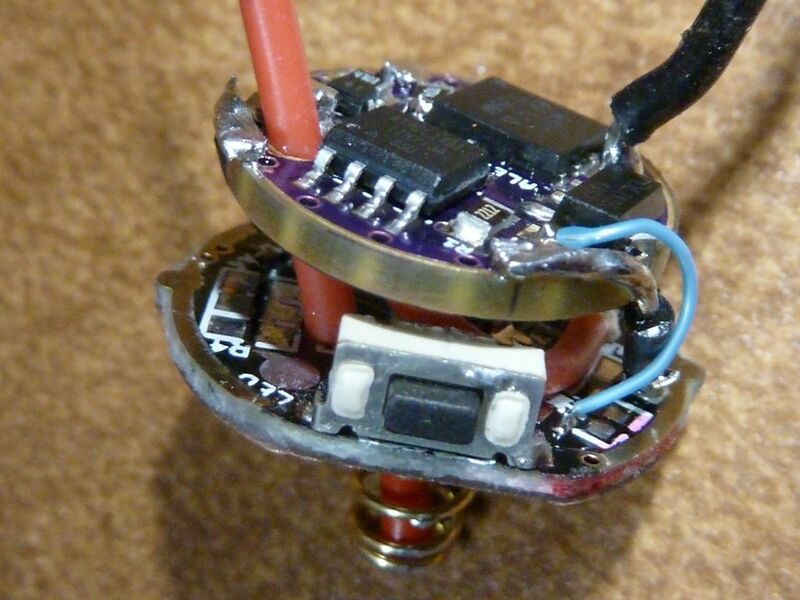 It may be a direct fit though, what’s the diameter of the gt mini driver? Nice CK! I did mod a bunch of these lights, and have still maybe 1/2 dozen more to mod. I searched and searched, found active sources for a while - GearBest then even Amazon. Best price was maybe $9, but typically $11-$12. I added an AUX/switch LED but using a light pipe next to the switch. I prefer having the light by the switch. Let me know if that's the right link - would love to use these drivers, makes the mod much easier. Does it use the stock switch or do you replace it? Btw, with these switches I always add epoxy support on the backside because I've seen a few of these switch types broken, or even just bent back. The bent back ones sometimes don't fail, just makes it harder to click. Ohh, also, why are you using R1/R2? I think Anduril has support for them but it takes to parasitic drain. We eliminated using them a while back, but maybe you find them more reliable? I suggested subtitles for the driver. 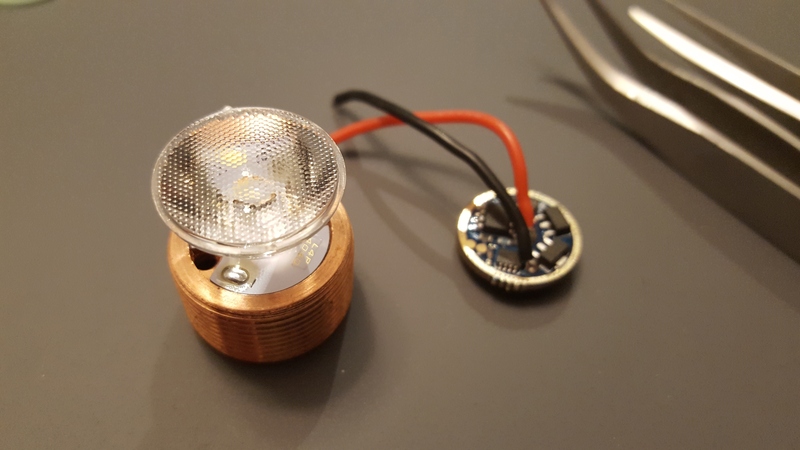 I am looking for a driver for the substitution in Lumintop sdmini. As for size, I have to measure. 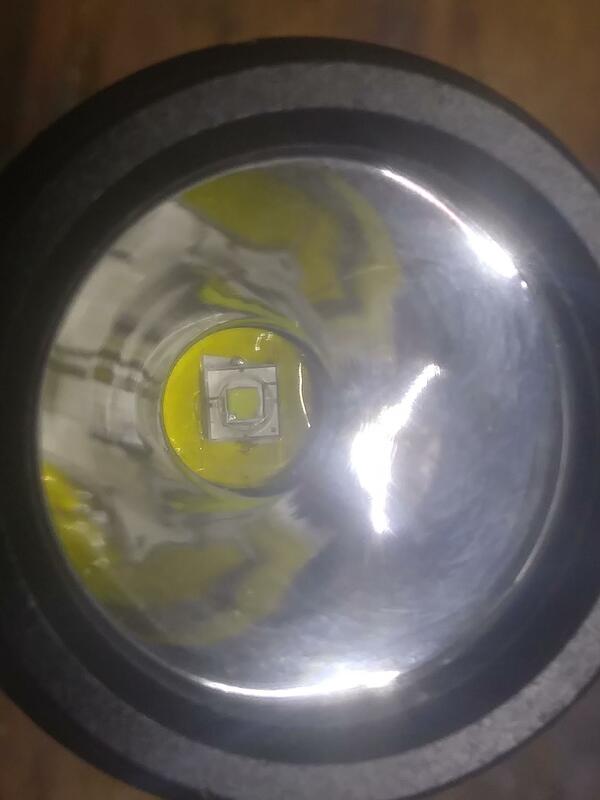 I swapped the leds in my modded F3X. 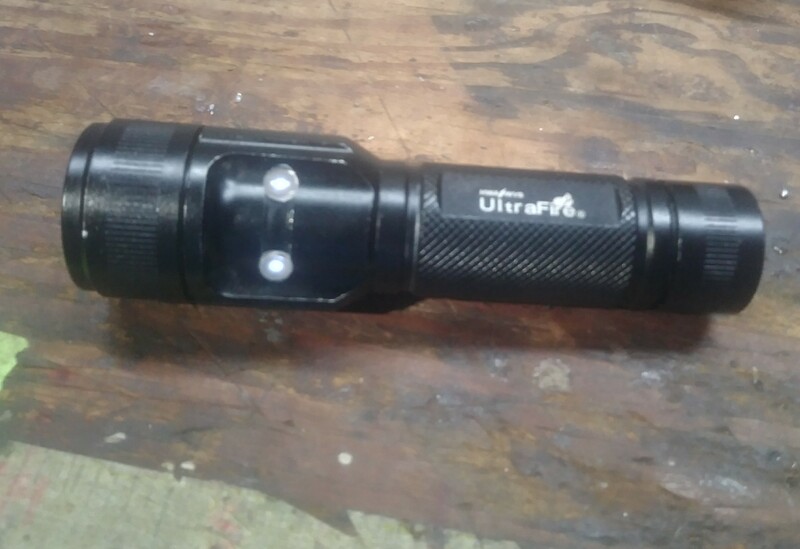 It had a tint mix of XM-L2 leds that put out 2700 lumen and worked very well but I have other lights in that lumen class now that have better tint than this 73 CRI light. 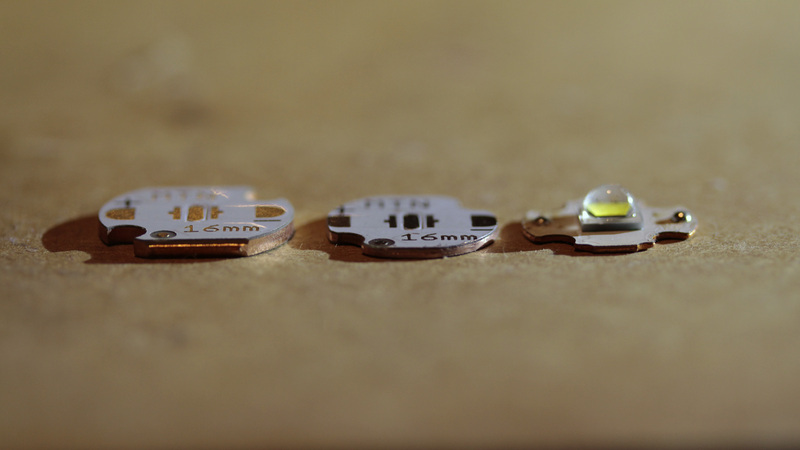 So now it houses 3× 400nm 5050 Epileds leds that together draw 8.6 A. This is serious output that together with yellow glasses shows a lot of dirt in my kitchen (did you know that boiled peas are bright red?). 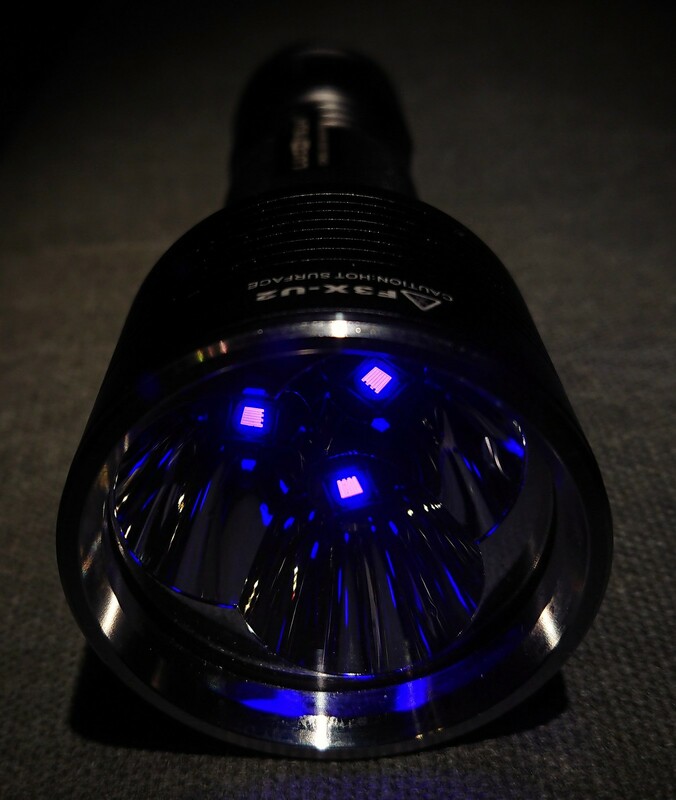 Actually I like the size and form of the F3X a bit too much for making it into such a niche-light, if new high CRI 5050 leds may hit the market some day (SST-40? ) 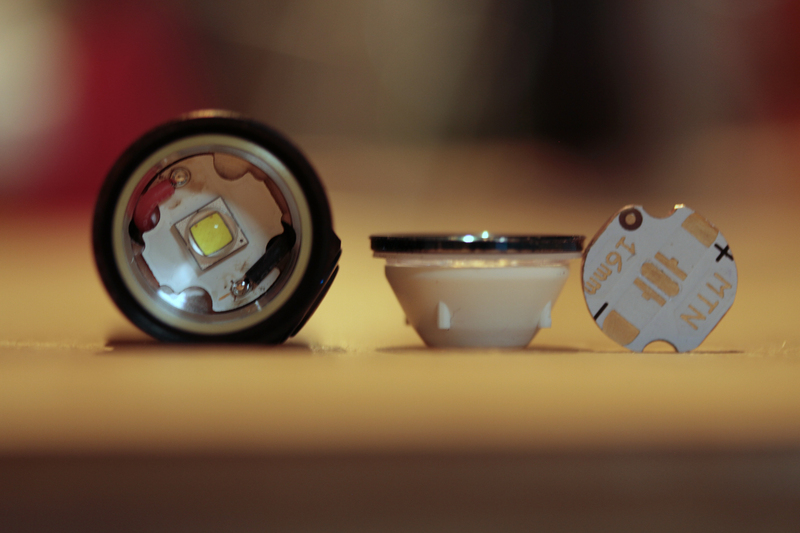 it is time for another led-swap. Verry nice Djozz! And I also have some lights ready for some new hcri 5050s let’s hope it happens some day. Green leaves on a plant also fluoresce red under the UV, FWIW… or at least my Red Savina Habanero plant does so. @Tom_E yep that’s the one. 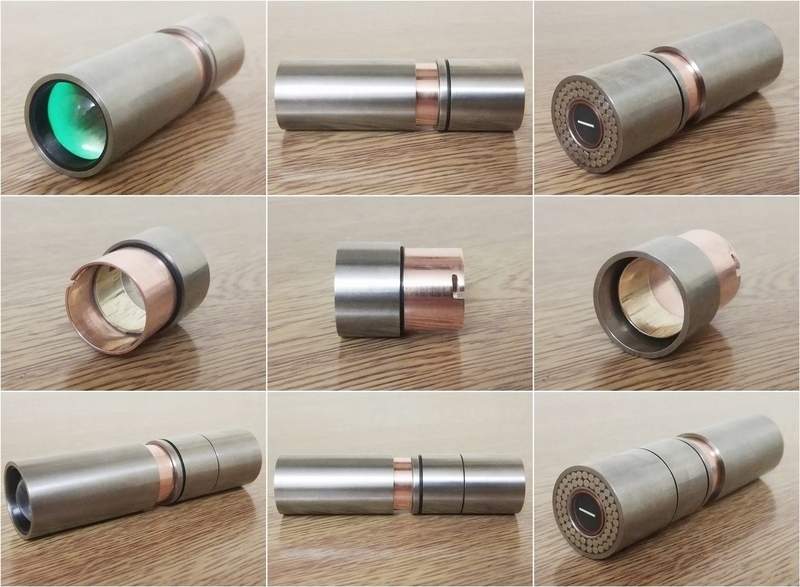 I love your light pipe solution, much more elegant then me shoehorning top hats in there lol. 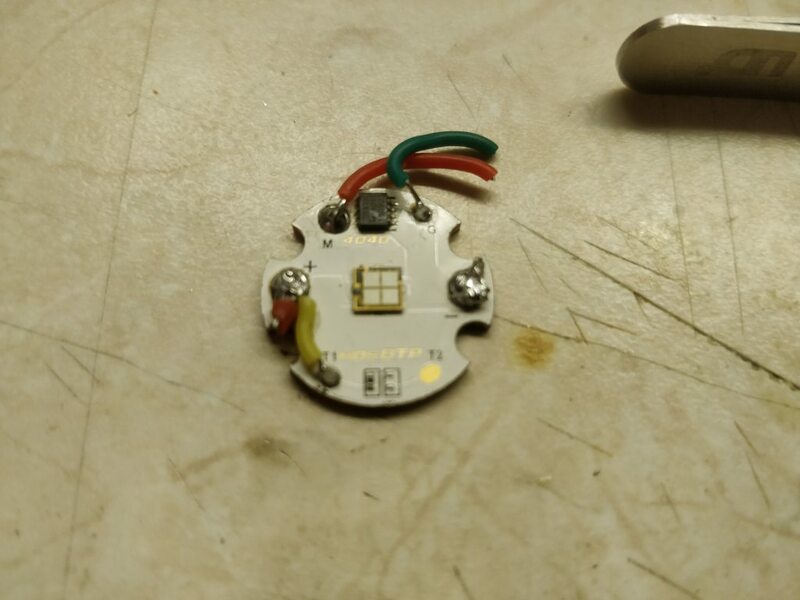 I just used 5mm led’s mainly to fill the holes from the charger port / charger port rubber cover, had those holes not been there I likely would have forgone an aux LED all together but your version is awesome (and probably way more efficient with the SMD LED)! I really like the light since switch orientation is so easy to figure out blind cause of the body shape, no fumbling it around in hand trying to find it by feel and no actual need for the aux led’s (but they’re still cool as hell), it just falls into your hand orientated right cause of the scalloped part of the head. 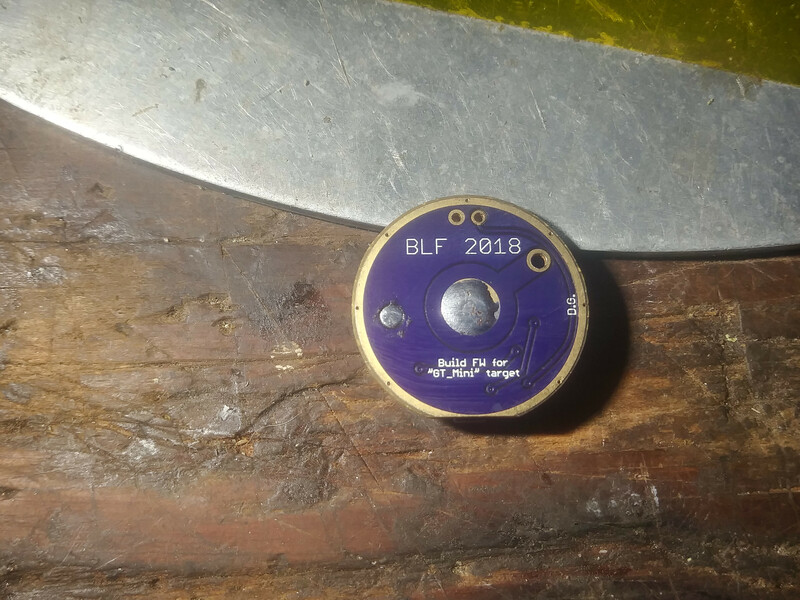 About the voltage divider, when I designed these a few months ago I hadn’t yet really looked into the FW to understand it could measure voltage directly so I just made the driver an exact clone of the gt_mini (hints why the resistors don’t follow the typical TA / DEL naming convention, i.e. the vdivode is actually R4/R5 on these, not R1/R2). 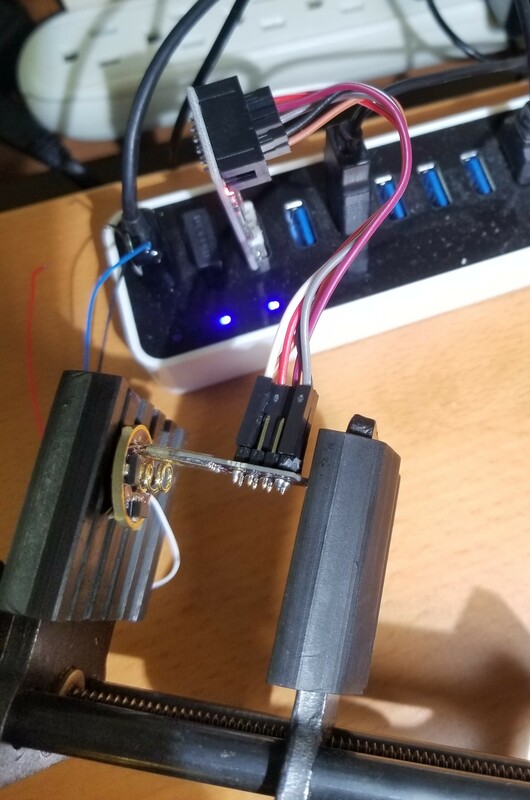 Measured standby current when running both the 5mm white led’s on high is only 3uA so while im not to concerned about it IRL I’ll definitely look into that for future builds. 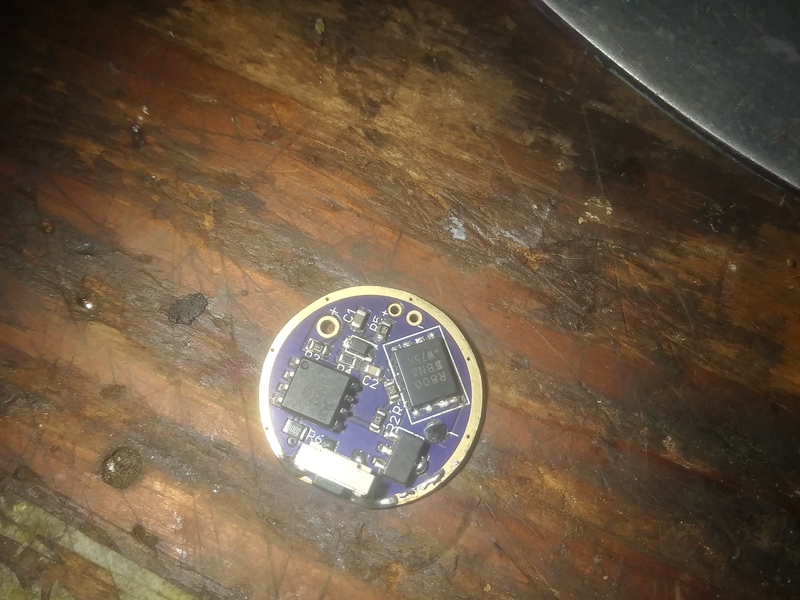 Is it a FW change or do I just physically remove the voltage divider and FW automatically knows to read voltage from pin 8 internally when it doesn’t see anything on pin 7? 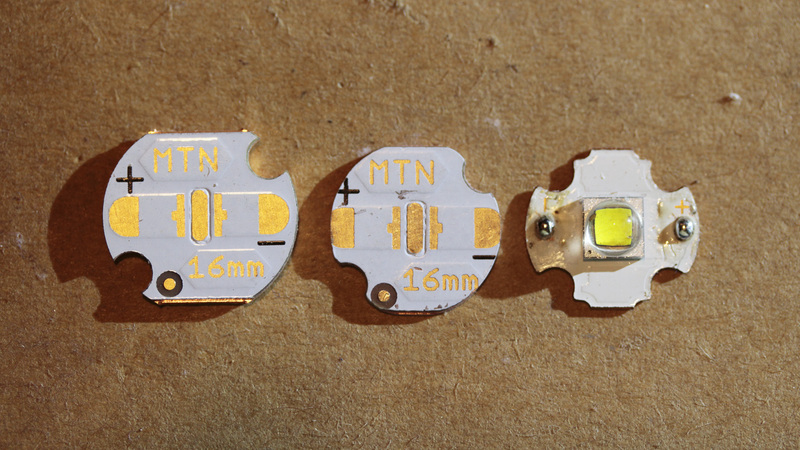 It probably helps the resistors are 910k/300k so it’s much lower draw than the typical 19k/4.7k pair would cause. 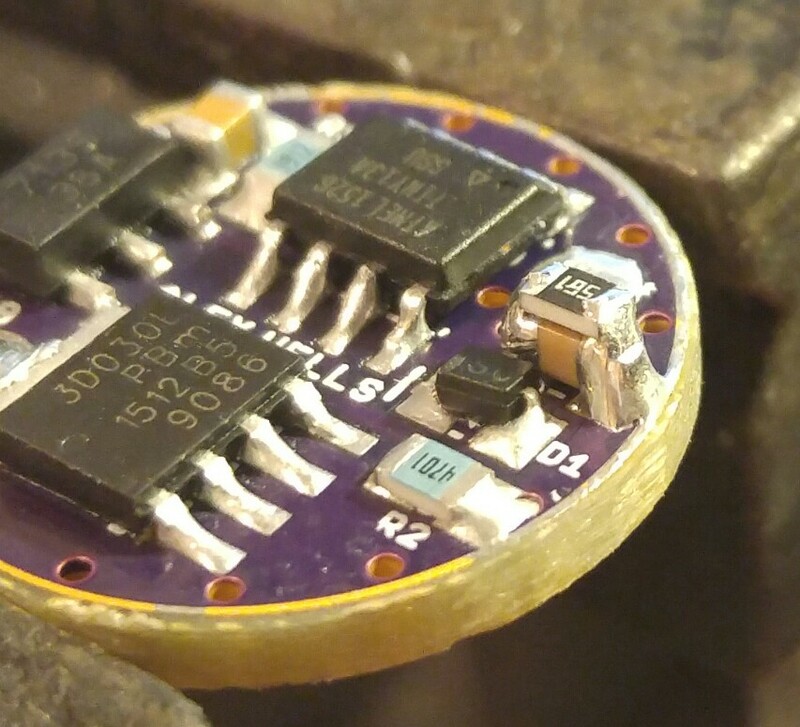 Oh one final note: the MCU pad is that of a tiny13 so you need to do the leg bending trick but you can still fash it with an SOIC8 clip afterwards, I didn’t have an 85 part and was lazy when I did the layout, if you’re not a fan of that trick LMK and I’ll swap it for an 85 pad (I have one now) and re-upload it to oshpark before you order (there’s plenty of room on this board for the 85 pad). The switch is one I sourced but I bet the stock one fits, looks just like it. If you try it and the stock switch doesn’t fit LMK, I ordered 40 of ‘em so I can stick a couple in a envelope for ya if need be. Btw thanks for knowing what to call it (zy-t11 clone), now I just gotta source one more for me to build myself! Thanx CK! 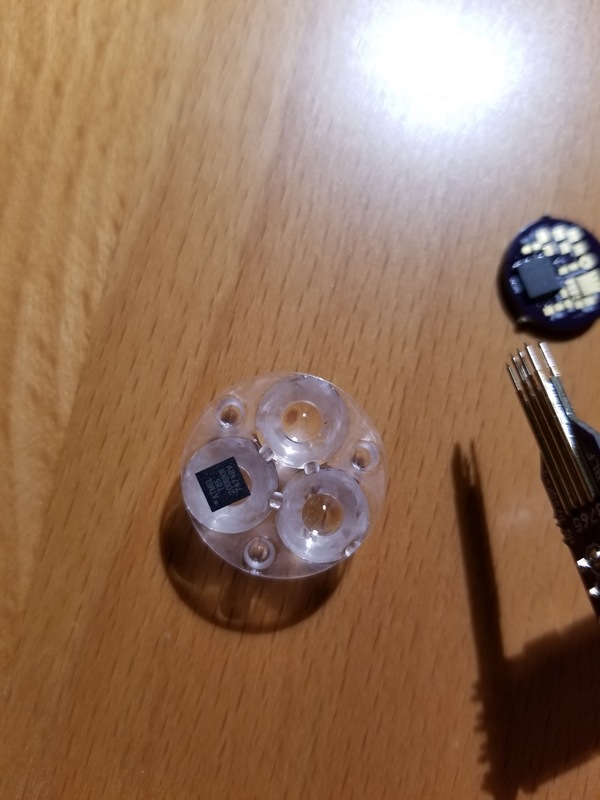 Actually I got a couple different types of these switches, so let me try mine first, or re-use the stock one - I need to figure it out, but first I need to order a bunch of these boards! 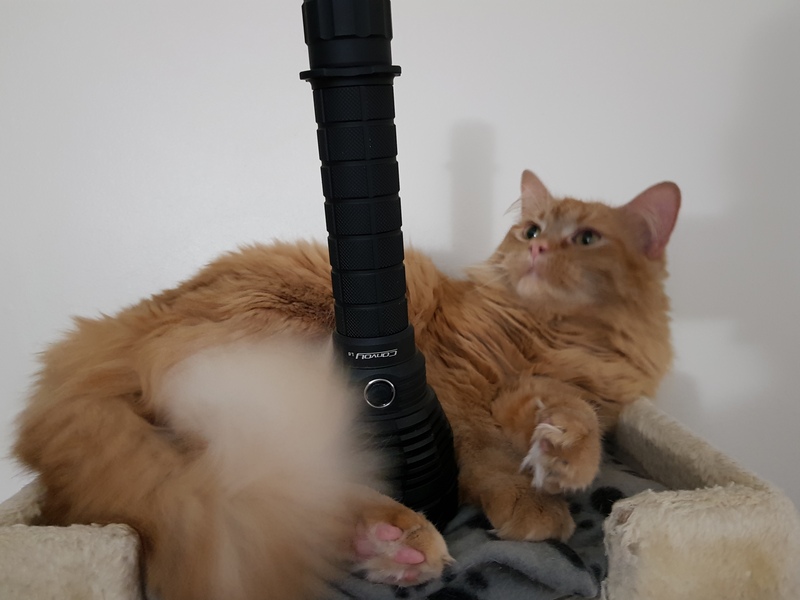 I agree - this is a nice little light for cheap. 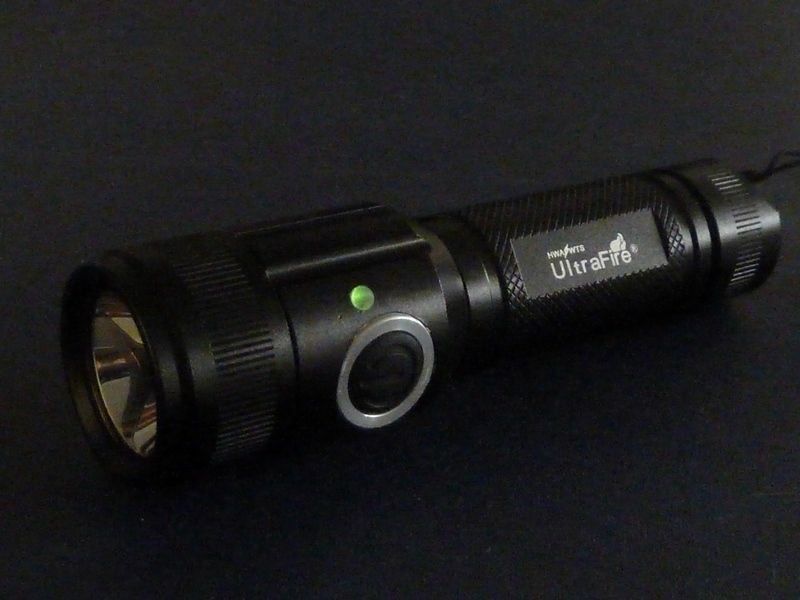 For me though, the Lumintop SD Mini is "the" light in this form factor - moddable, smaller, light weight, great reflector, excellent finish, quality threads, quality lens, switch w/LEDs, deep pocket clip, decent price, etc. Of course they dropped it now (sure, get rid of a good thing?? ), but might still be available though probably pricey. The modded SD Mini is still in my top 3 of preferred EDC's. On Amazon and I think BG they were sold under the MECO brand. Amazon price was $9.75 in June 2015. Oh I dig it. Thats awesome. That UV mod is pretty nice too. 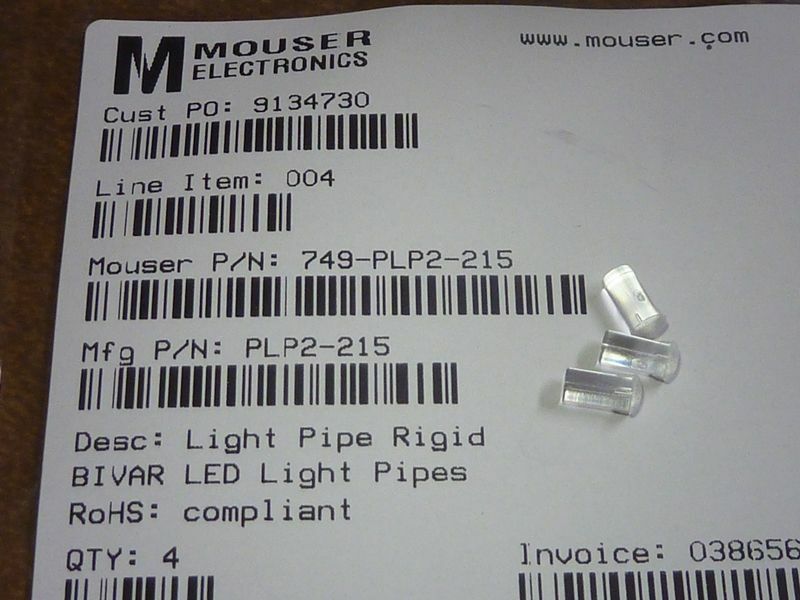 I broke down and ordered one of the cheapie 50+ UV LED versions to track some rodents that found their way into out house…. Couldnt wait for an S2+ shipped from China. 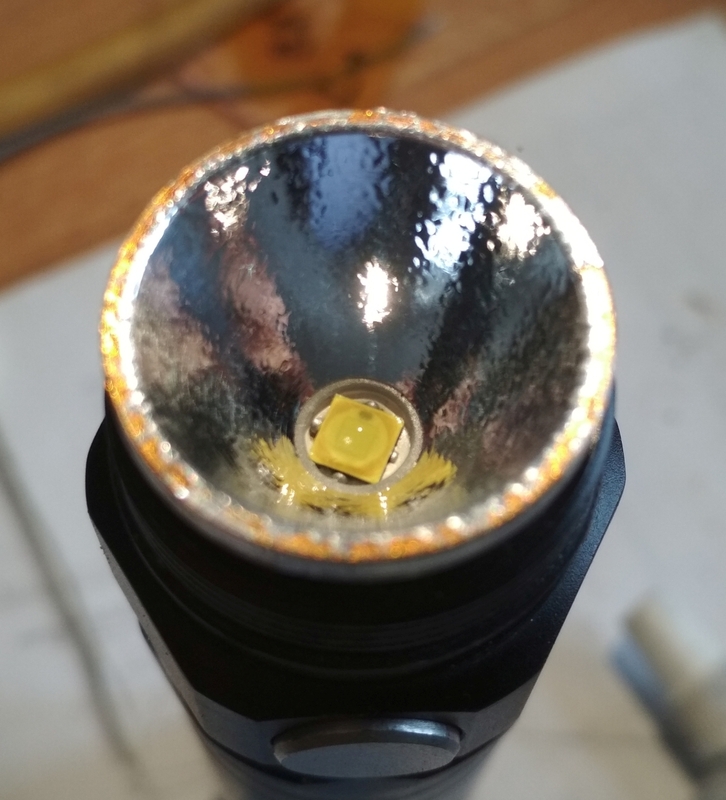 The old Astrolux E01 got a Luxeon V2 “upgrade”. 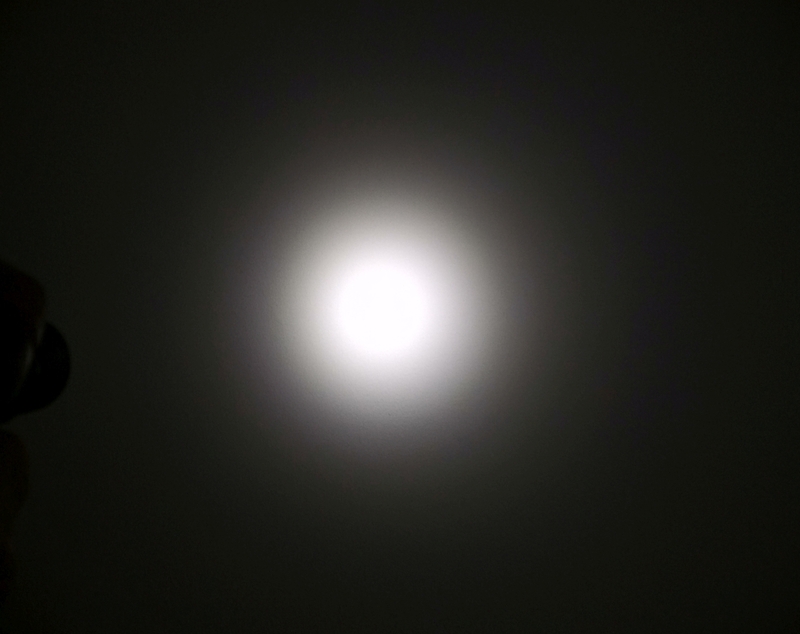 It had a 90CRI LH351D before, which had good output but was a bit too floody for my taste even with a shaved emitter. Current is set at 3.05A on turbo, 1.05A regular max IIRC. Looks better in actual life than in this picture. @Scallywag, I did that (but reflowed the V’s on the stock board) and those 7 seconds are over 5000 lumen. You must love that! Cool staticx57, no more disassembly for flashing. You can’t imagine what I started today Actually started two mods at the same time. They will be long projects. 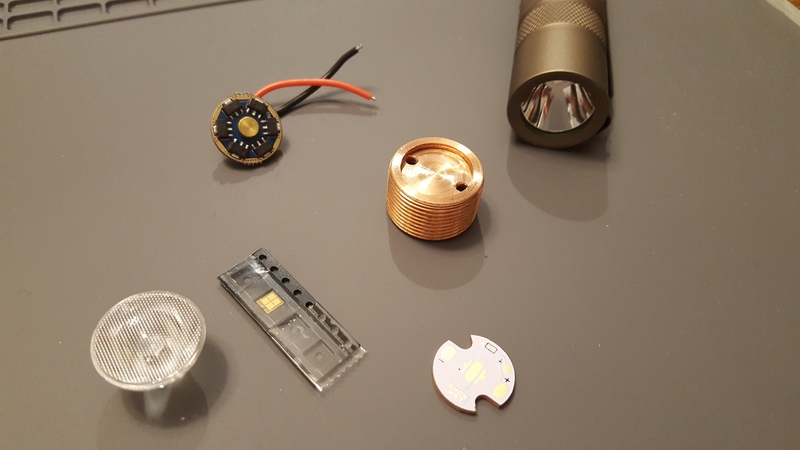 One involves 3D printing and the other will have lots of lumens. 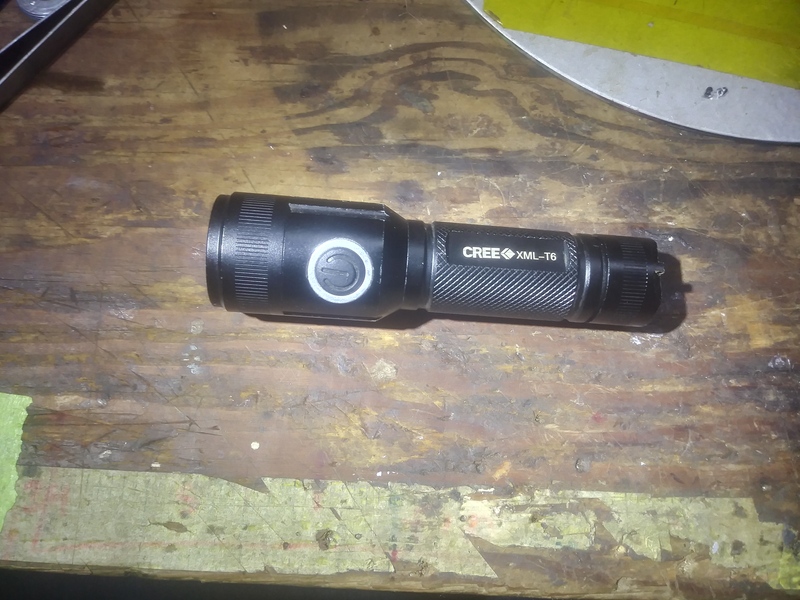 Maybe not Acebeam X70 lot or not even Imalent MS12 but very close I will make a full build thread of both when finished. And video. 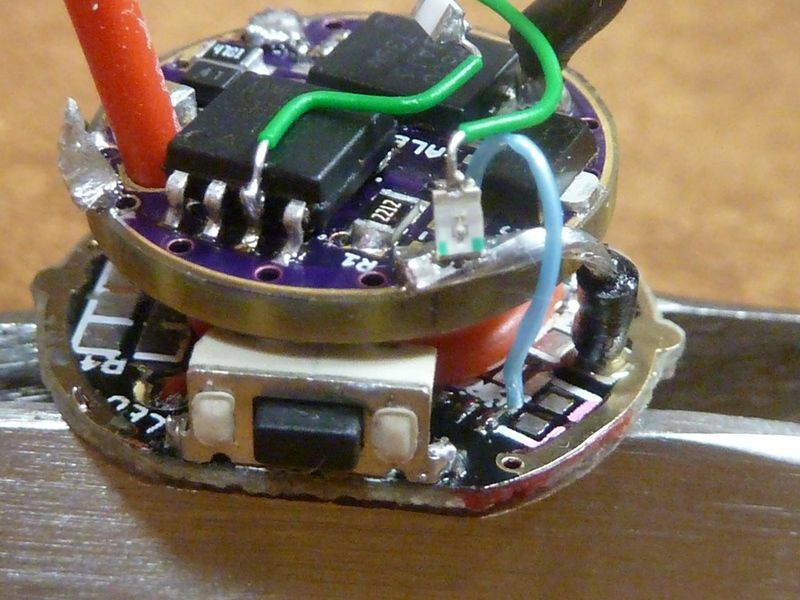 For everyone else here who also did a simmilar build – how did you manage soldering? I had a spare Panasonic NCR18500B and a cutting of titanium tube left over so made an optional extension piece for the CRX CuTi Zoomie Osram KW CSLNM1.TG. I have to ask, what kind of cell phone did u use to snap this pic? I dunno where you found that post but PD68 hasn't been on in 3 months. Ohhh - just found it, 3 years ago, post #19. I reflowed an 3500K XHP50.2 in one of my Sofirn SP33’s. I think the original tint is in the 5700 to 6000k range. Probably should have used a 4000k but this one was pretty nice. Here’re the inside works, with replacement board. In my excitment to finish before dinner I closed it up before taking a pic and I didn’t want to open it again. 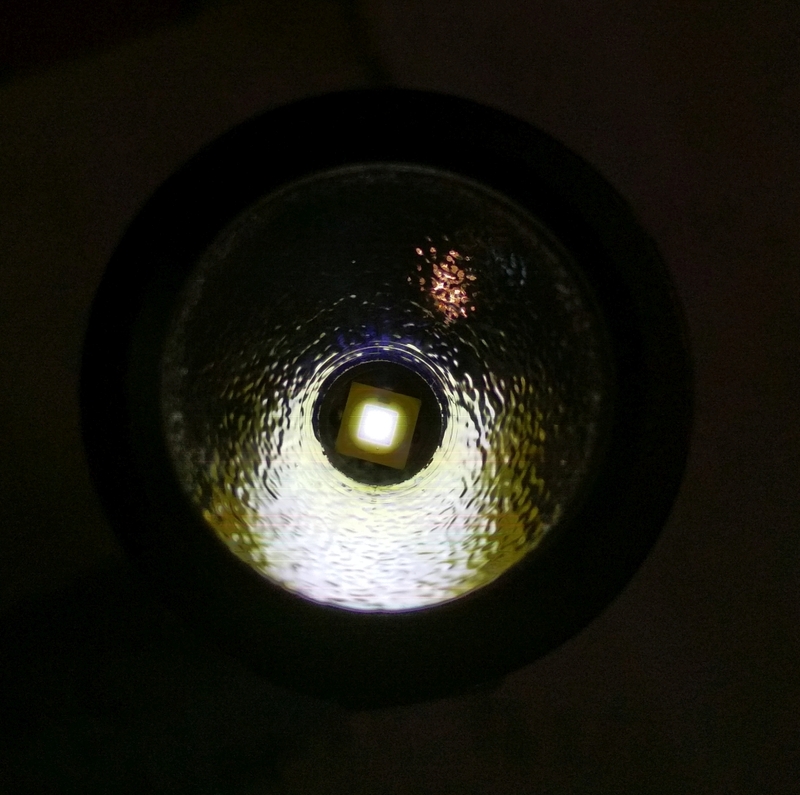 But FWIW, here’s the beamshot of XM-L2 Before (on photo left) and LH351D After (on photo right) The ever so slight green is gone and in it’s place is a whole lotta hi-CRI goodness. Nice job shaping the MCPCB to fit. I find that sort of filing and sanding work to be the most satisfying. Yeah, it’s the kind of mindless task that you can do while watching TV or just want to zone out with some soft music.